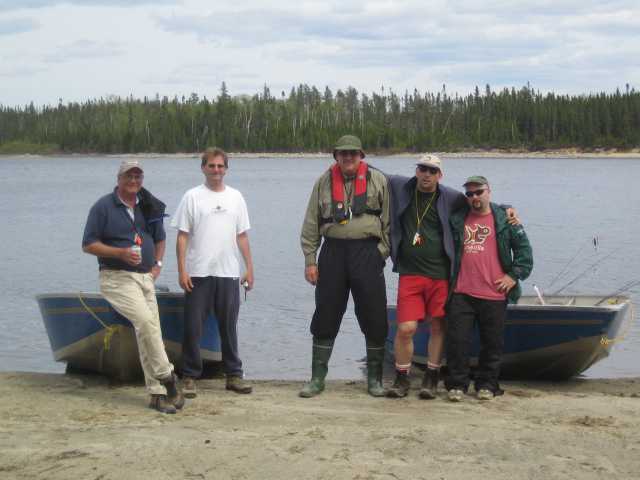 Last July I went with my two sons and a couple of friends to Plummer’s Lodge on Great Bear Lake in the North-West Territories. This was the trip of a lifetime. If you are into fishing, this place has got to be on your bucket list. Ben and Nick wrote up what has got to be one of the best brotherly fishing stories going….they each caught a 48lb lake trout on the same day. For us, fishing trips have been a part of the family DNA since we were young. A lot of our fondest memories growing up come from family fishing trips with our father. So for Ben, it was an obvious choice to pick a fishing trip as a university graduation gift. With the world as our oyster, Ben chose the one place that few people would – the Arctic. The world-class fishing and uniqueness of the setting would result in incredible family memories that were too good to pass up. Once Nick heard that the family was going up to Great Bear Lake he made plans to join – making the trip all the way from South Africa. It made the journey from Ottawa seem miniscule! 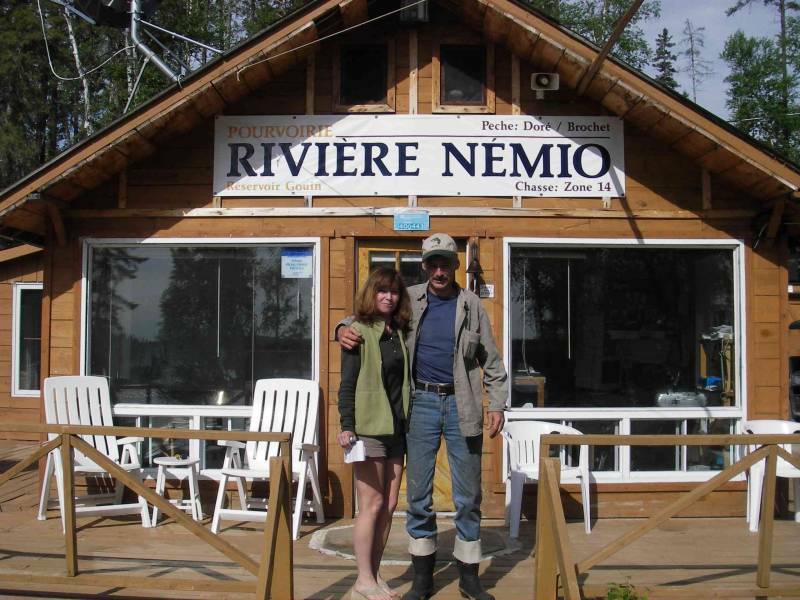 Our travels to and from Plummer’s itself was memorable as the nights spent in Yellowknife allowed us to try local cuisine that we would never experience normally. We were met at the airport by a Plummer’s representative who made us feel comfortable and made sure we got to our hotel safely and with all our gear. After 2 years of planning, the last night before actually going to Plummer’s felt like an eternity! Not only because we were all so excited to get on the world renowned water, but because we got to experience the midnight sun in Yellowknife. Even come 1am we were still looking out our windows to see some of the best scenery we had ever witnessed. After getting only about 2 hours of sleep, we were back at the airport with 30 other excited anglers, and some even more excited guides. We had picked the opening week so many of the guides hadn’t even gotten there yet themselves. We got all the gear and people loaded onto the plane and we were off. The views from the plane were something I will never forget as you fly over some of the most beautiful, yet barren landscape you will ever experience. On the ride itself, we were lucky enough to sit beside one of the guides and pick his brain early about strategies and spots and what works and what doesn’t. It was his third year here and he was literally shaking he was so excited to get there. The landing itself is something you will never forget. Landing a large jet on a dirt runway with no airport is something I was always interested in seeing. You would never even be able to tell as it was one of the most seamless landings I have ever had. Stepping off the plane and breathing the freshest air you ever have is one of the greatest feelings you will ever have. After taking some quick photos of the plane and the runway we quickly grabbed our gear and hurried down to the boats they had waiting to taxi us to the lodge. When we arrived at the lodge they had a top notch lunch waiting for us with our licenses and everything ready. It was a quick meet and greet for everyone to meet the lodge crew and go over the rules and then we were assigned our cabins. We quickly brought all of our belongings to the cabin and tossed them on the beds and starting rigging rods. Our three guides came by and went over what we would need and brought us lures that we should use. Luckily for us, the guide we sat beside on the plane was one of our three guides so we were off to a quick start! We were the first to hit the water that afternoon and it was a perfectly calm day. The water was like nothing I had ever seen before as it was clear, calm, and perfectly blue. It looked like a Caribbean oasis more than an Arctic lake but to me it was perfect. For both of us, the goal going in was to get a 20 pound lake trout. The guides assured me it would happen and I should get many more. We were beyond excited to finally have our lines in Great Bear Lake after so long of imagining it. The action was steady right from the start as my father and I each got a few 12-15 pounders the first afternoon. Needless to say, we were quite ready for 5 more days of fishing like that! Our first night at the lodge was fantastic. The food the chef prepared was absolutely incredible and really hit the spot after a day on the water. The bartender was great as well, somehow already memorizing everyone’s names and stories. The next morning we woke up ready to go and after a quick breakfast we were on the water again. The morning started off great with plenty of action and we had more than enough for lunch by 10am. The lunches the guides prepared were something you would expect from a 5-star restaurant, not something they can whip up on the shores of a lake in the Arctic. We had lake trout 9 different ways over our time there and each and every one was fantastic. Even the non-fish fans in our group were amazed with how good the lunches were. By day 3, the promise of 20-pounders had yet to be realized. However, Our father caught a 32 pounder the second day which was deemed ‘The Miracle Fish’ as they thought they were snagged and ending up getting completely spooled before hand-lining the fish in! I thought to myself if a 32 pounder feels like a rock, imagine a 50 or even 60 pounder! The 5th day of the trip our group did a fly out to ‘The Inlet’ which is where the world record Lake Trout was caught some 40 years ago. Going to bed we all had dreams of catching the big one. We were out early and the plane ride was short and smooth. If you closed your eyes you never would have been able to tell when you took off or when you landed. All the pilots were extremely professional and talented. We got going quickly in The Inlet but didn’t have much luck for the early part until about 11am we got into a school of Butterfly Lake Trout. We caught about 15 in a 25 minutes span ranging between 8-15lbs. The monster still eluded us. At around noon Nick decided it was time for a sandwich. A couple minutes later he had his rod in one hand and sandwich in the other when all of a sudden his line started flying. A few minutes into the fight we finally got a glimpse of the fish and all it took was one view of its tail and the whole boat flew into action – we knew we had our 20 pounder and then some. In a matter of seconds it was utter chaos in the boat. With Nick battling the fish, our guide working the boat and the net, and Ben videotaping and balancing the boat it truly was a team effort. After about an additional 15 minute fight at the boat (would have been longer but we were in shallow water so it could not dive deep) we wrangled the fish into the boat. It was by far the largest fish I had ever seen and weighed in at an astounding 48lbs! After about 10, ok 20, minutes of celebrating we looked around the boat and it looked like a bomb had gone off. The sandwich my brother was eating was everywhere, boxes were overturned, and lures everywhere. We couldn’t help but laugh. After we cleaned up the boat we got back to it. Now it was Ben’s turn. With renewed hope and a healthy dose of sibling rivalry – the afternoon was all about getting Ben’s trophy. We chatted with our guide and decided to focus on “hunting monsters” as he put it. A few more hours of fishing had gone by and we had gotten a few nibbles but nothing big. The plane was coming at 5pm to pick us up so at 4:30 our guide said the famous fishing line: “one more cast”. Ben threw his spoon back in the water for one more pass across a drop off. As he was conceding defeat and reeling in his last cast at The Inlet , WHAM! A hit like no other hit Ben had ever felt and suddenly he was in battle like never before. Once again chaos overtook our boat. This time we were in much deeper water so the fish was able to run a lot more. After about 10 minutes we saw this fish and thought it was even bigger that the first. 20 more minutes passed and the fish was still diving with ease. Finally, at about the 40 minute mark it was tiring and coming closer and closer to the surface. After what seemed like an eternity, our second “fish of a lifetime” of the afternoon was in the net. Ben almost collapsed from sheer adrenaline and excitement overload. The guide got the scales out and to our surprise, it was another 48 pounder. After the best day of fishing in our lives, we had come out tied! We each had our 20 pounder, and then some! To this day our smiles are just as big when we talk about our day at The Inlet and our time at Plummer’s. We also wouldn’t have been able to have the experience we did without the heroic efforts of our guide throughout the day. Boating two 48lb fish in an afternoon is really a team effort and his quick thinking, boat manoeuvring, encouragement, and photography skills were a key ingredient to the day of a lifetime. It was an incredibly unique and special opportunity for us to each be able to battle a beast and to share that experience and memory with each other. In our long history of family fishing memories, this is definitely one that will never be topped. Plummer’s is truly a special place. From the staff, to the scenery, to the water, and of course the fishing, Plummer’s is a place where memories and stories of a lifetime happen. P.S. The boys’ old man did sort of okay that day as well. A 34-pounder is still a pretty nice fish! P.P.S. Thanks to Alex, Brandon and Carl for a fantastic week on Great Bear. The guides at Plummer’s are all great, but these young men really made our week. 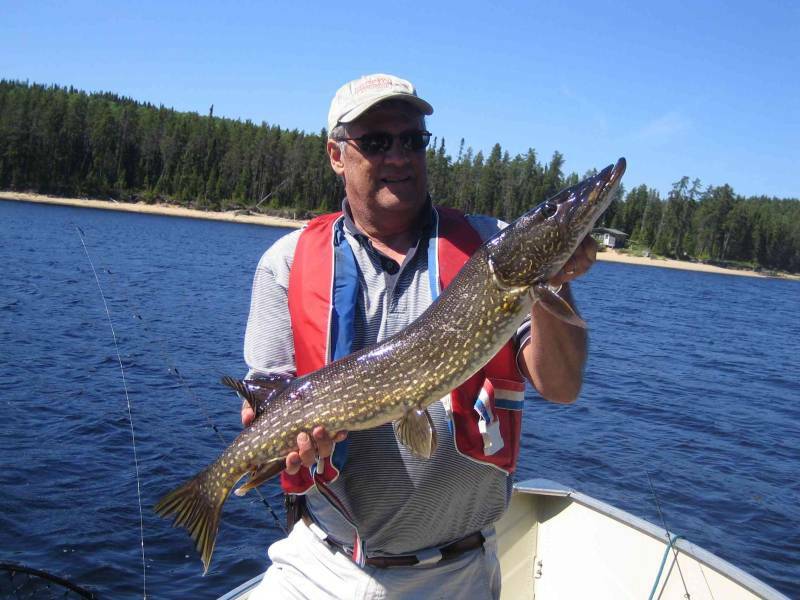 Only three more sleeps until we’re on our way to our annual trip to the Gouin Reservoir and Nemio! Special mention goes to Jon and Randy for making the trek all the way from Phoenix, AZ for the event. P.S. I stayed up and watched the first two periods of the Ducks-Wings game last night. To be honest I think Ottawa is going to win the Cup. Sens in 5 ! I checked and Nemio has satellite TV coverage, so we will be able to see the games while we’re there. 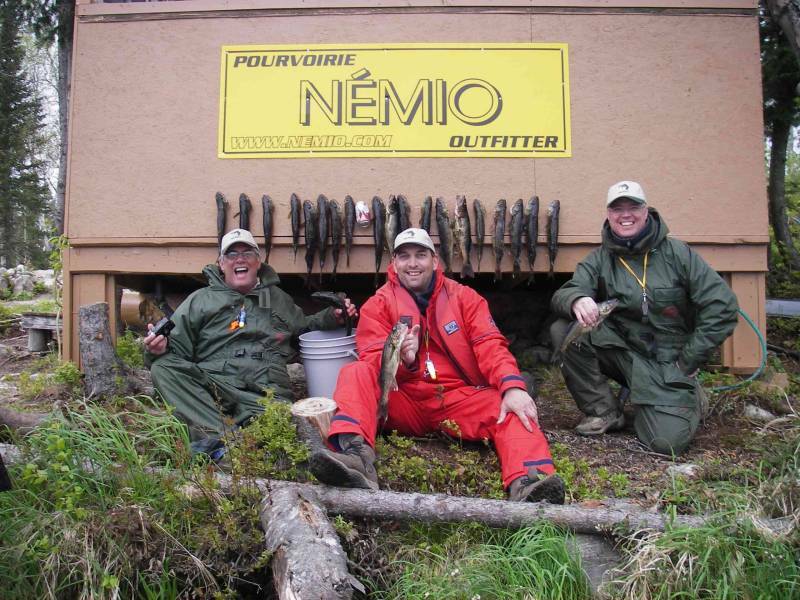 So I sent the deposit cheque today….We’re off to Nemio Outfitters for our May fishing trip for the third year in a row. Ron and Rosie and great folks, and we really enjoy spending time with them. We actually picked the dates based on the lunar calendar. It will be interesting to see if there is any truth to the old story that the fish bite more during full moons.